Below is a table identifying daily and aggregate (possession) limits per person. Anglers may take and possess one limit of each species of fish. 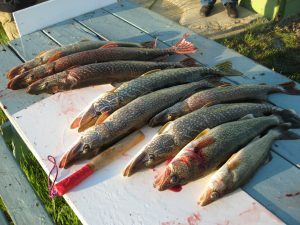 For example, one angler can have both 5 pike and 4 walleye in his/her possession. 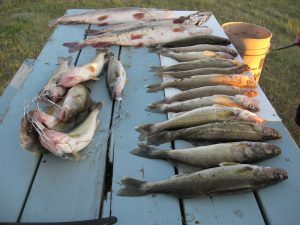 The limit includes any fish that are eaten or given away. For example, after fishing day one, the angler keeps 4 walleye and eats one of the 4 that day. On fishing day two, the angler can keep 1 additional walleye as he/she still has 3 walleye in possession from the day before. Fish that are at your camp, being transported by you or by someone else for you or stored for you are included in yourlimit. The length of a fish is determined by measuring the total length of the fish with the tail pinched. Species limits are a vital part of fisheries management. In order to enforce these limits, our conservation officers must be able to count and measure your fish. Anglers must package their fish in such a way that fish can be readily unwrapped, separated, identified, measured and counted. It is illegal to can or block freeze fish outside of the home. All dressed fish and fillets must have, at least, a 2.5 cm (1”) square patch of skin with scales intact from a portion of the body other than the belly. Fish packaged in this manner can be easily identified. A fish cannot be reduced to more than two fillets. For best quality, fish should be packed in ice when caught. One of the best ways to transport your fish so they can be counted and identified is in clear plastic freezer bags. only 2 fillets per package. Stocked trout species include brook, brown, cutthroat, rainbow, splake and tiger trout.